2,000 ha across a wide range of fertile loam and peaty soils. On farm the Ritchie’s grow a mix of arable crops and vegetables for processing, and graze sheep and beef on grass and forages. The couple were awarded the prestigious Hawke’s Bay Farmer of the Year in 2014, and Hugh is a director on the Foundation for Arable Research and Horticulture NZ boards. During the visit we’ll hear about work to implement variable rate irrigation and precision drainage, manage nutrient losses from his farm, and protect the soil through conversation tillage. As we head back towards Hastings we’ll stop at the Pekapeka wetlands for lunch and a walk around one of the few remaining large swamps in Hawke’s Bay. HBRC Open Spaces manager Stephen Cave will tell us more about the history of the area, biodiversity and role of wetlands in local ecosystems. Our next stop will be True Earth Organics which is situated near Bridge Pa and a number of renowned wineries on the Gimblett Gravels. Owned and operated by Scott Lawson and partner Vicki Meech, the 65 ha farm converted to organics in 1994 and produces blueberries and fresh vegetables for domestic and export markets. A focus on enhancing the biological system is central to business success, with a large investment in building soil through rotations, green cropping, organic inputs and reduced tillage. Scott is also a founding member of the LandWISE group, which promotes sustainable production practices across the cropping industry. The final stop will be the McCain Food factory in Hastings where we will be hosted by Mike Flynn, Supply Manager for the company. McCain produce a variety of frozen vegetable products using materials sourced from the Heretaunga and Ruataniwha plains and the factory tour provides a unique insight into how crops are turned into high value export food products. The tour will end back at the Napier War Memorial Conference Centre. The Spectacular Soils field trip promises to wow and amaze students of soil and earth scientists of all ages. Starting with an overview at Te Mata Peak we will travel across the alluvial plains and the low rainfall loess covered downlands through the huge ash-covered, tilted slabs of Neogene sandstone, limestone and conglomerate, up to the pumice and greywacke of the Kaweka Range. 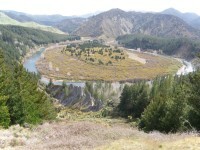 We will be stopping at sites with increasing elevation, rainfall and proximity to the Taupo Volcanic Zone as we head inland to the west, crossing from Pallic Soils to Allophanic, Pumice and finally Podzol Soils, with a special focus on the “missing link”, where a duripan is present under an Allophanic Soil. This two stop field trip will begin with a visit to Mangarara station owned and run by 2017 Hawke’s Bay Farm Forester of the Year, Greg and Rachael Hart. The property, which has an attractive balance of flat land, rolling hills and steeper hill-country, was one of the first stations in Hawke’s Bay to farm sheep back in the 1850’s. Mangarara continued to operate as a conventional Hawke’s Bay sheep and beef farm until around 12 years ago. Since then, Greg and Rachel have been transitioning their farming operation into what they hope will be a model of ‘regenerative’ agriculture. Greg and Rachel’s alternative approach to farming recently featured on Country Calendar. They have adopted integrated and holistic farming principles that includes restoring native biodiversity, building healthy soils and reconnecting people back to the land where their food comes from. In terms of production, this has meant diversifying what they produce and how they produce it, as well as where and how they market their farm product. The jewel in Mangarara’s crown is Horseshoe Lake. The 36ha wetland has an interesting history. An oxbow from an ancient river, the lake was engineered during the 1930s to harvest and store water. Even before their move to ‘regenerative agriculture’, Greg and Rachel had been planting trees to benefit livestock and protect their soil resource. Mangarara’s soils include heavy erosion prone steepland soils and peat soils that are vulnerable to degradation and wind erosion if not managed carefully. We will be given a guided tour around Greg and Rachael’s land before having lunch among beautiful surroundings at the Mangarara Eco-lodge. From Mangarara we will travel north for an hour to Te Awa winery located on the famous wine growing area of the Gimblett Gravels where Jonathan Hamlet, Chief Viticulturist for Villa Maria in Hawke’s Bay will meet us. Te Awa Winery is a special place. The full Maori name given to the site is Te Awa o te atua which means River of God, a reference to the subterranean streams over which Te Awa Winery is sited, and from which their wines draw their subtle characteristics. We will investigate several open pit soil profiles and discuss how soil type influences the taste of the wine. There will also be several types of wine on hand so you can see the difference for yourself!